D.D. Bullwinkel’s Outdoors philosophy is simple: the outdoors is our playground. With that as their foundation, the family-owned retailer has spent 25 years cultivating a love for the outdoors in their community of Transylvania County, North Carolina, simultaneously earning the store a reputation as an authority in the outdoor industry. DDBO and their ‘sister’ store, MooseTracks Footwear are two complimentary stores in one location. 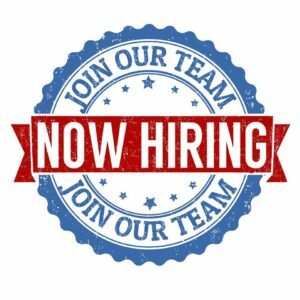 They are seeking to expand that vision even further with the addition of a new Sales Manager to oversee operations of their retail store. The Sales Manager will be provided the tools, training, and support to enhance his or her personal skill sets in order to grow the business and advance their own career. If you are interested in learning more about this position or applying, please click HERE. We look forward to hearing from you! The Perkins family was on hand Saturday to pick up the Business of the Year Award for D.D. Bullwinkel’s Outdoors. -D.D. 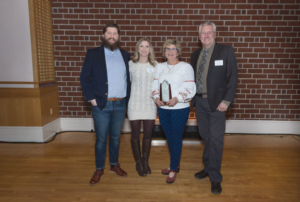 Bullwinkel’s Outdoors was named Business of the Year and Lucia Gerdes, owner of Cedar Mountain Canteen, was named Business Person of the Year during Saturday’s Bre-vard/Transylvania County Chamber of Commerce annual gala. It was a grand evening to kick off the “Year of Fun” at Brevard College‘s Porter Center. McCarson also recognized outgoing chamber president Tracie Trusler for her service to the chamber over the past year. “Tracie has been an amazing president a champion of the chamber,” McCarson said. In a brief speech, Trusler thanked the chamber for the opportunity to serve as its president and recognized all the members, staff and volunteers that make chamber successes possible. “Looking back, I’m proud to have been involved with the chamber these past few years and have been honored to serve as president this past year. We are fortunate to have an inspirational group of more than 525 members who support the chamber and their community. Also, your board of directors are passionate about what they do, as well as being generously dedicated to their community,” Trusler said. Following Trusler’s remarks, Clark Lovelace, chamber executive director, addressed the audience, offering recognition to the chamber’s volunteers and staff. Lovelace also took time to recognize the chamber’s 50 sponsors in the community, saying that without their help and resources, the chamber wouldn’t be as successful in its mission of assisting the business community. “As a nonprofit, the chamber couldn’t do much of what we do without the support of our sponsors. They are great community partners, they are our helpers, they are our funders, they are our supporters and we appreciate greatly everything that they do,” Lovelace said. At the conclusion of the sponsor recognitions, it was the awards portion of the evening. The first award of the night was Business Person of the Year, presented by Prentiss Brewer, with the chamber. The Business Person of the Year went to Lucia Gerdes, owner of Cedar Mountain Canteen. Gerdes also serves as vice president of the Friends of DuPont State Forest Board of Directors and the Cedar Mountain Community Center Board. In her remarks, Brewer said Gerdes’ attitude exemplifies that of a successful small business owner and radiates to those around her. “[Lucia] provides a shining example of how making a difference in the world is often best started by making a difference in your community. [She] is an outstanding business-woman, community leader, and giving neighbor who we are all honored to know,” Brewer said. The next award was Business of the Year, presented by Candice Walsh, executive director of the Cindy Platt Boys & Girls Club. Business of the Year went to D.D. Bullwinkel’s Outdoors. In announcing the winner, Walsh cited the impact of the business on the vitality of downtown Brevard, but also recognized the business owners’ – Jimmy and Dee Dee Perkins – commitment to the community through participation in festivals and other initiatives. “Beyond the impact of the business, the owners are among the most involved in Brevard and Transylvania,” Walsh said. The next award was Nonprofit of the Year and was presented by Page Lemel, Transylvania County Commissioner. The NonProfit of the Year award went to Smart Start of Transylvania County. “The nonprofit organ-izations in Transylvania County do tireless, unforgiving, and important work. [Smart Start] has been doing just that as a champion for young children in Transylvania County for 23 years,” Lemel said. Lemel said over the past two years, thanks to the work of Smart Start, the high quality four-year-old preschool program for income qualified families has increased the number of available spaces for children by 300 percent. During that period, they have also increased their operational revenue by 62 percent. She also recognized Smart Start’s new collaboration with the Sesame Street in Communities initiative, which was announced last year. “From efforts with other nonprofits like The Family Place to Transylvania businesses to local government to Transylvania County Schools, [Smart Start] are committed to their focus to ensure that young children enter school healthy and ready to succeed,” Lemel said. After accepting the award, Deborah Tibbetts, Smart Start executive director, delivered some brief remarks, thanking all the people who work with Smart Start for their dedication and looking optimistically at the future to provide even more care for the county’s youth. “I really just want to thank the staff, the board and all the volunteers with our organization, as well as our community partners. And you haven’t seen anything yet. We’re just beginning and I hope that the whole community joins us in this journey to advance the lives of our younger citizens,” she said. The next award was the Esther Wesley Award, which is given annually to an individual for his years of service and support to the chamber. Trusler presented the award to Dean St. Marie. St. Marie formerly served as chamber president in 2017, but has been involved with the chamber for many years, including two full terms and one partial term on the board of directors. “[Dean] has served on numerous committees, specifically making significant contributions to the chamber’s ‘buy local’ initiative from a few years ago and the more recent push to strengthen our governmental affairs efforts,” Trusler said. Trusler also cited St. Marie’s involvement in the community outside of the business arena, specifically his involvement with organizations such as Friends of the Ecusta Trail and the Pisgah Forest Rotary. “Since coming to the area as a transplant, [Dean] has been a fixture in the local business community, with their love and pride for Brevard and Transylvania shining in every possible way,” she said. The final award of the evening was the Duke Power Citizenship Award, presented by Craig DeBrew, district manager for Duke Energy. The Duke Citizenship Award went to Mark Burrows. Among the many projects and organizations Burrows was involved with over the years were the Heart of Brevard, Brevard College, TC Arts Council, BrevardRotary Club, Project Empathy and the Land of Sky Regional Council. DeBrew added that Burrows’ passion and selfless service to so many in the community was what set him apart and made him a clear choice as the award recipient. “In this person’s numerous nominations for this award, coworkers, friends and colleagues noted that they are dedicated, devoted and passionate about improving lives in TransylvaniaCounty,” he said.